If the length of the blog is determined by the price of the product, then I better keep this article short. After all, the Mi Band costs a mere S$19.99. It is the cheapest branded activity tracker. Before buying, do check if your smartphone is running the latest Android 4.4. Anything lower cannot work. I made a mistake of buying one for my dad, not realising that his Xiaomi Redmi Note 3G is still running in Android 4.2. I foolishly assumed that any Xiaomi smartphones launched in the last 12 months should already be running on the latest OS. Anyway, his loss is my gain. He passed the band to me and I installed it on my HTC One M8 without any hiccup. Why, you may ask, should you get the Mi Band, and for what purpose? Right. Er… so, what is the purpose of tracking your steps, your sleeping hours, your calories burned, etc.? To me, the only purpose is to gather data. The Mi Band – or any fitness band – provides such data for you to understand what your body has been doing all day long. If you set a workout goal, such data is important, but if setting workout goal is a critical purpose for an fitness band, you would probably have bought a more expensive brand. So, speaking for the rest of the general public who is willing to pay only $19.99 for a fitness gadget, this band will capture data of your body activity. One aspect of tracking that may interest some of you is sleep tracking. Mi Band magically detects whether you are in deep sleep, light sleep, or awake. Of course, it’s all based on the movement detection on the Mi Band. 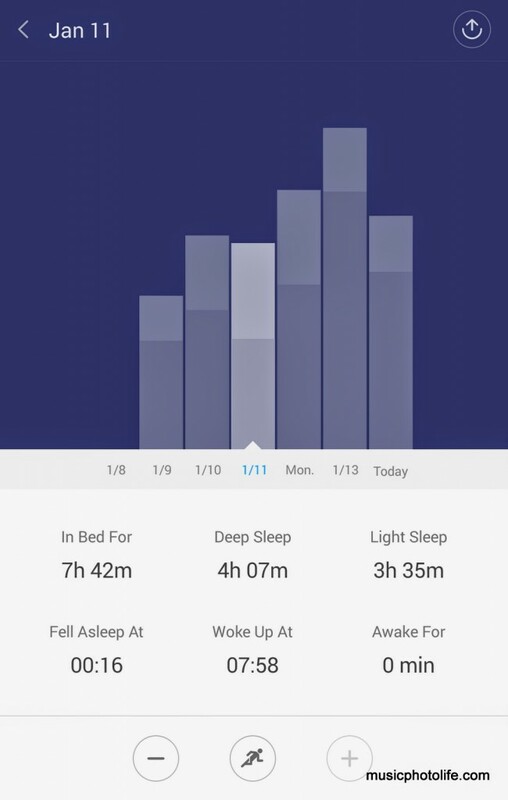 So if you tend to move your hands during sleep, the Mi Band detects as light sleep. Whatever the case, it offers an insight on how you sleep at night, whether you toss and turn regularly or sleep like a log. This is my FAVOURITE feature for any activity tracker (and it’s probably just me). Mi Band wakes me up subtly by vibrating on my wrist. It does not disturb my wife, it does not irritate me with an audible alarm which I need to reach out to deactivate. In the event that I snoozed the alarm and got up of the bed, I do not have to worry about forgetting to turn off the snooze alarm on my phone sitting next to my bed. Even if the alarm goes of on the Mi Band, it is with me, inaudibly vibrating. And since the Mi Band is waterproof, I could disable it even with wet fingers. For non-Xiaomi phone users, the Mi Band vibrates when there are incoming calls. For Xiaomi phone users, the Mi Band can auto-unlock if the phone is within proximity. And without a display screen, the Mi Band is very limited in displaying smartphone information like some other activity trackers could do. This is probably the strongest reason for getting a Mi Band. The battery life is 30 days, so you literally wear and forget that it’s a piece of battery-operated gadget. This is unlike most other fitness bands where you need to charge once every few days. Besides, there is nothing to fiddle with on the Mi Band unlike other fitness bands where you can press buttons to see display information. So you literally wear and forget about it, allowing the Mi Band to track your activity without distractions. The Mi Band device is actually very small, and so you can actually customise with colour straps or pendant holders so you are not limited to wearing on your wrists. You could even clip it on your keychain for those who dislike wearing the band. Xiaomi has once again made a tech product so affordable that everyone can own one. Need a cheap but good headset? Mi Earphones. Want a cheap but good power bank? Mi has it. If the Mi Band is not good enough for you, there are a lot of brands out there who are more established. Do look out for their features and make sure you are paying more for features not available in Mi Band. If the Mi Band feature list is all you need, then there is no reason to pay many times more. Still considering hard? Come on, it’s just S$19.99.